Intrinsically linked to watchmaking since the world’s first watchmakers’ corporation wasborn in 1601 under the name “Maîtrise des horlogers de Genève”, Geneva has become home to the greatest concentration on the planet of mono-brand and multi-brand boutiques per square kilometer, quite apart from the cultural institutions that give visibility to the art of measuring time. A pedestrian route now provides an opportunity to admire them all by visiting the most iconic areas in the city, following in the footsteps of Swiss watchmaking history. By including some 50 mono-brand boutiques and as many multi-brand retailers, the Watch Tour provides an overview of the Swiss watchmaking panorama, while visiting Geneva’s most symbolic districts – such as the station and the tourist office for a start, followed by the shopping quarter in the centre, the old town with its art and decoration galleries, the banking and cultural institution district, as well as the modern art district which is home to the Patek Philippe Museum. Everything started in the mid-16th century, when the head of the reformation, Jean Calvin, promulgated an interdict on showing outward signs of wealth in Geneva, forcing the jewellers and goldsmiths to direct their skill towards watchmaking creation. 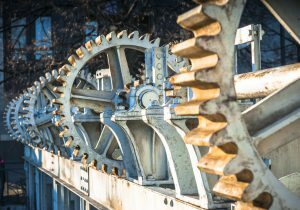 Two centuries later, Geneva was exporting around 60,000 watches, and because there were too many watchmakers in the city at the end of the lake, they moved to the Jura. In 1909, to celebrate the 400th anniversary of Calvin’s birth, which coincided with the 350th anniversary of the foundation of the Geneva Academy, the authorities erected the five-meter high Mur des Réformateurs (Reformers’ Wall) in the Parc des Bastions, opposite the Grand Théâtre. Statues of the movement’s four great figures stand against part of the old wall that surrounded the city up until the 19th century. Even Geneva’s emblem par excellence, the Jet d’eau, has its origins in the city’s watchmaking foundations. Geneva’s watchmaking vocation, combined with the organization of labor division (known as établissage, attributed to goldsmith Daniel JeanRichard) from the 18th century onward, led some 4,000 watchmaking craftsmen to settle around the Rhône in order to use the available hydraulic energy, notably that emanating from the Bâtiment de la Machine as of 1872, and that of the Coulouvrenière waterworks from 1886.This pressurized water enabled a large number of operations involved in the manufacture of movements and watch cases, such as milling, to be mechanized. In their “cabinets” or workshops, the men who became known as the “cabinotiers” (master watchmakers) closed the indispensable water tap at virtually the same moment at the end of their day’s work, giving rise to over-pressure which the machinists in the Coulouvrenière then had to urgently compensate by stopping the pumps. One of them had the bright idea of installing a safety valve allowing the over-pressurized water to escape skywards up to about 30 meters high. This became such a ritual display for riverside inhabitants that the Jet d’eau was eventually moved and made an institutionalized tourist attraction in 1891 by Geneva’s town council. What happened to the “cabinotiers”? Aside from a heritage that has earned Geneva its international reputation, their activity also made its mark on the architecture of the St Gervais district (between the station and the Rhône), where the precious pressurized water facilitated the work of the craftsmen. Oriented towards the light from the north, their “cabinets” were mostly set up in their homes or on upper floors with big bay windows. Running on from the Pont de la Machine, Rue Rousseau (7 and 9) still has many such windows, as does the Rue Chantepoulet (25) below the railway station. 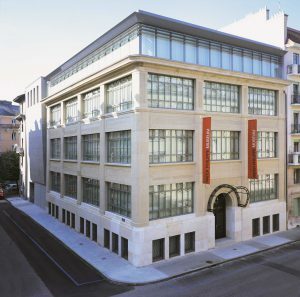 In an eloquent tribute to the spirit of the “Cabinotiers” that gave rise to the House of Vacheron Constantin in 1755, the oldest watch brand in uninterrupted activity has completely renovated its historical headquarters on the Quai de l’Île that it has occupied since 1875, designed by the architect of Geneva’s Grand Théâtre. Open to the public and for guided tours on request, Geneva’s biggest watchmaking museum is none other than the Patek Philippe Museum, whose four floors exhibit important watchmaking and enamel collections from Geneva, Switzerland and Europe, from the 16th to the 20th century. An earlier part of the Geneva Watch Tour features two clocks that are radically different but equally spectacular. 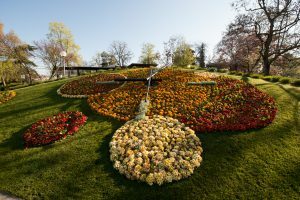 The Horloge Fleurie (Flower Clock) in the Jardin Anglais (English Garden), the most photographed monument in Geneva after its Jet d’eau, consists of 6,500 flowers divided into eight concentric circles that change with the seasons and has the longest seconds hand in the world at 2.50 meters. The Passage Malbuisson clock, between the Rue du Rhône and the Rue de la Confédération, provides a musical show for passers-by every hour. Designed by Edward Wirth, its 16 bell chimes emit a melody inspired by a song from the Escalade (a big popular Geneva festival commemorating the defence of the city in 1602 in the face of an attack by soldiers from Savoy).